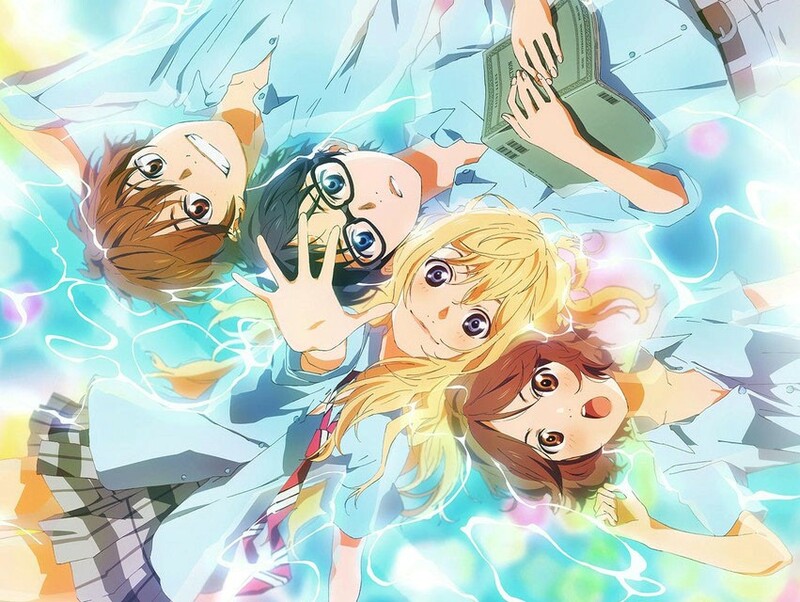 Just after “Your Lie in April” concluded, out came their OVA. 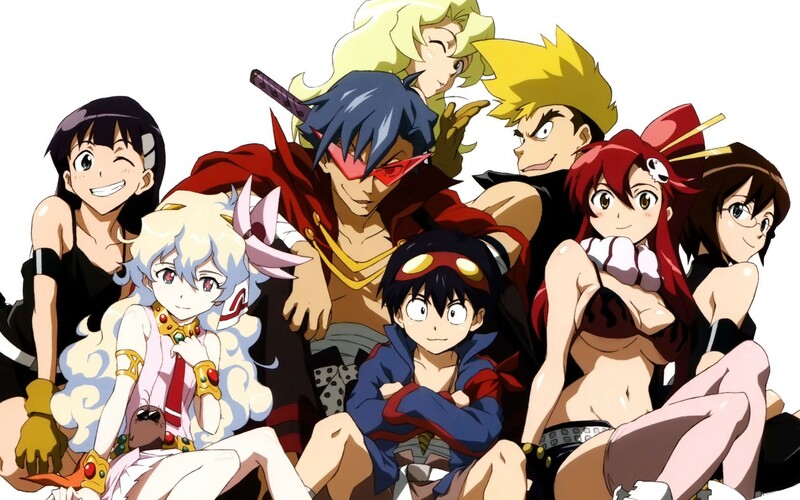 This is a rare OVA, in that you have to see the series all the way through before you can honestly watch the OVA. The entire OVA is referenced throughout the series and it makes a caliber of sense when you see this, as you were given all the clues. I am assuming it is about four years earlier, so everyone is 10 or so, although the picture may give an indication of being eight. It’s hard to tell. We have the three main players on that bench, each noshing on their favorite treat. This is another in the “Girls Who Save the World” genre, but, potentially, taken to the zenith of the idea. 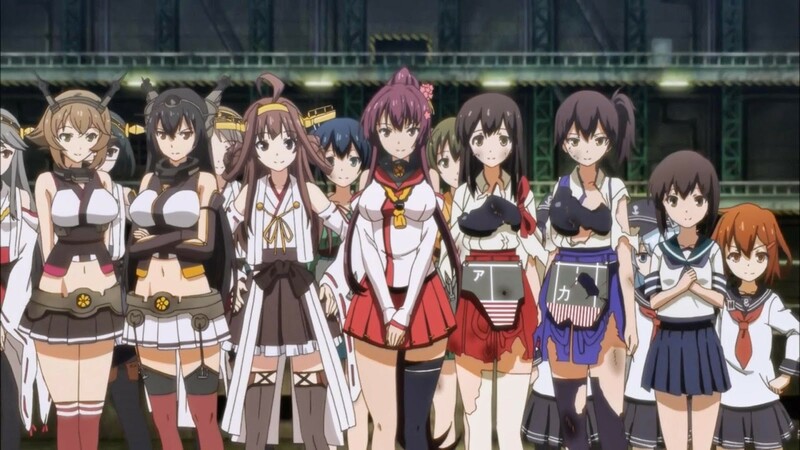 Also, sharing a lot with shows like “Upotte” and “Strike Witches”, “Kantai Collection” (also known as “Combined Fleet Girls Collection” and the nickname “Kancolle”) really goes all out with things. Yeah, this is another “Girls Who Save the World” anime, but the operative word here is ‘save’. 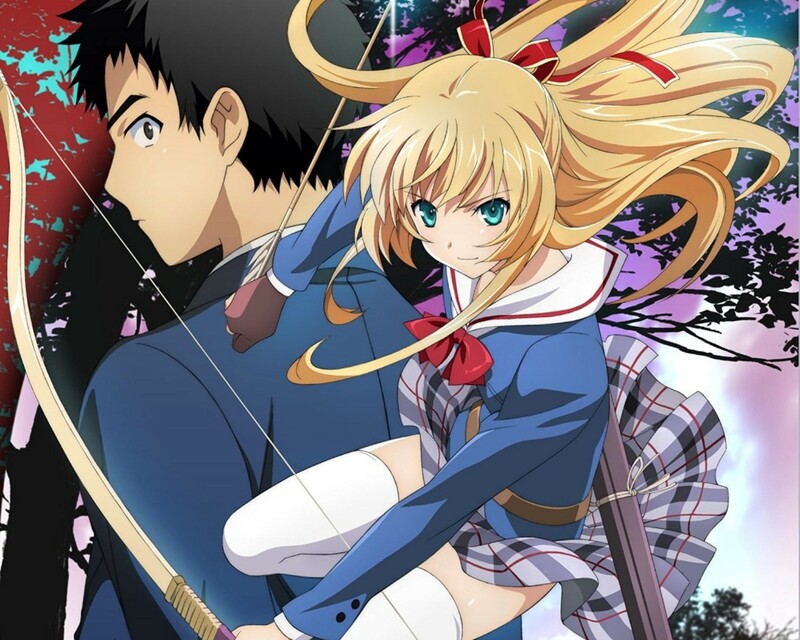 I’ll explain “Isuca” as we go along. We start off with Shinichirō Asano. To the entire world, he appears to be your typical anime high school male: just a tad on the clueless side. He follows some woman down a darkened street or alleyway or another caliber of pedestrian pathway. She then turns into a gigantic soul-sucking centipede or some other ilk of icky bug (please, keep your comments to yourself about women until the end, OK?) He is saved by a bow-wielding archer that cuts down said bug woman in nothing flat. This woman is Sakuya Shimazu, a well-liked classmate. We also learn that she is destined to be the 37th head of the Shimazu family, who, for generations, have been sealing away youmas and other nasties that crawl in the night (but no politicians. Drat, but you can’t have it all). I actually had a chance to view this about six months earlier, but the capsule description seemed a bit uncertain and I’m not a fan of music shows. I find they are in the area of sports shows, where we end up focusing too much on the performance and the show loses something about the people. 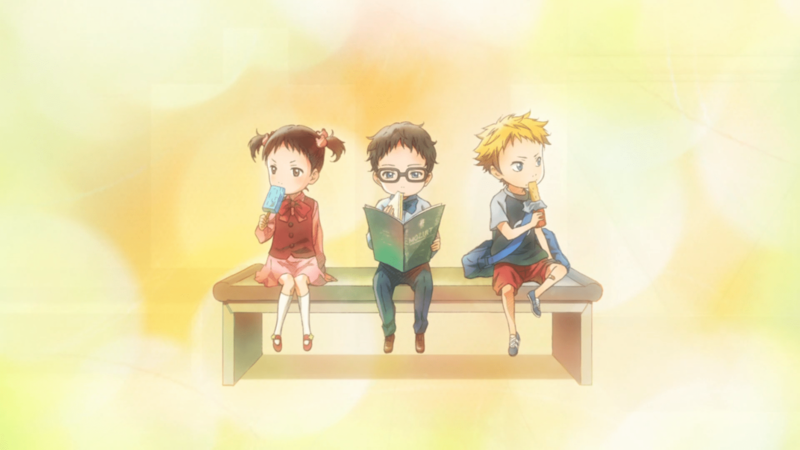 But then I heard that this was a really romantic series, the best in the past few years. On Free Comic Book Day, one of the offerings was a manga sampler, of which the first chapter of this tale was shown. Well, with all these promotions, I had to see it. With the end of the first season of “Tokyo Ghoul”, there was still a huge amount of work to do and things were not properly resolved. 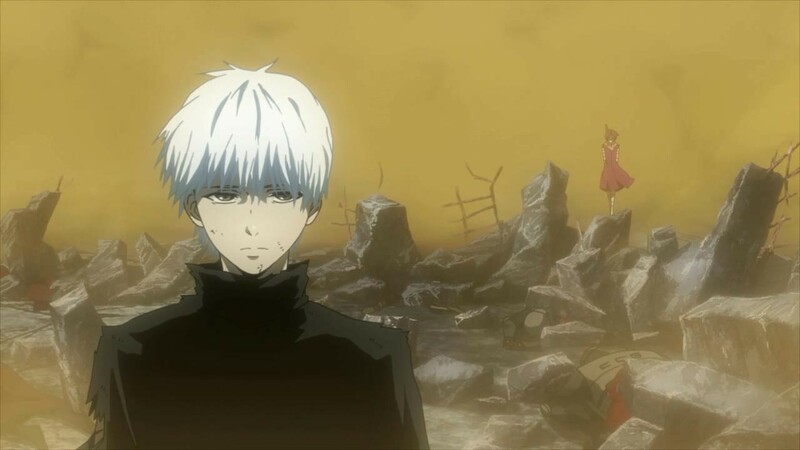 The second season, which appears to be called “Tokyo Ghoul Square Root of A (“Tokyo Ghoul √A”), picks up where the first season left off and therein lies the troubles.